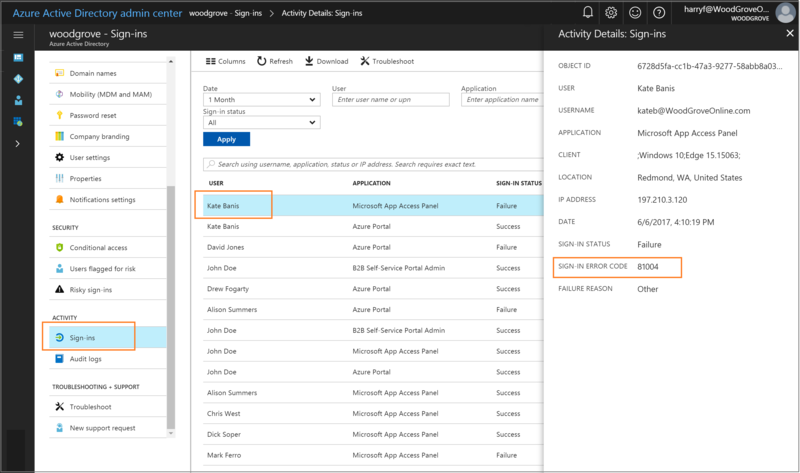 This article helps you find troubleshooting information about common problems regarding Azure Active Directory (Azure AD) Seamless Single Sign-On (Seamless SSO). In a few cases, enabling Seamless SSO can take up to 30 minutes. If you disable and re-enable Seamless SSO on your tenant, users will not get the single sign-on experience till their cached Kerberos tickets, typically valid for 10 hours, have expired. Microsoft Edge browser support is not available. If Seamless SSO succeeds, the user does not have the opportunity to select Keep me signed in. Due to this behavior, SharePoint and OneDrive mapping scenarios don't work. Office 365 Win32 clients (Outlook, Word, Excel, and others) with versions 16.0.8730.xxxx and above are supported using a non-interactive flow. Other versions are not supported; on those versions, users will enter their usernames, but not passwords, to sign-in. For OneDrive, you will have to activate the OneDrive silent config feature for a silent sign-on experience. Seamless SSO doesn't work in private browsing mode on Firefox. Seamless SSO doesn't work in Internet Explorer when Enhanced Protected mode is turned on. Seamless SSO doesn't work on mobile browsers on iOS and Android. If a user is part of too many groups in Active Directory, the user's Kerberos ticket will likely be too large to process, and this will cause Seamless SSO to fail. Azure AD HTTPS requests can have headers with a maximum size of 50 KB; Kerberos tickets need to be smaller than that limit to accommodate other Azure AD artifacts (typically, 2 - 5 KB) such as cookies. Our recommendation is to reduce user's group memberships and try again. If you're synchronizing 30 or more Active Directory forests, you can't enable Seamless SSO through Azure AD Connect. As a workaround, you can manually enable the feature on your tenant. Adding the Azure AD service URL (https://autologon.microsoftazuread-sso.com) to the Trusted sites zone instead of the Local intranet zone blocks users from signing in. Seamless SSO uses the RC4_HMAC_MD5 encryption type for Kerberos. Disabling the use of the RC4_HMAC_MD5 encryption type in your Active Directory settings will break Seamless SSO. In your Group Policy Management Editor tool ensure that the policy value for RC4_HMAC_MD5 under Computer Configuration -> Windows Settings -> Security Settings -> Local Policies -> Security Options -> "Network Security: Configure encryption types allowed for Kerberos" is enabled. In addition, Seamless SSO can't use other encryption types, so ensure that they are disabled. Ensure that the Seamless SSO feature is still Enabled on your tenant. You can check the status by going to the Azure AD Connect pane in the Azure Active Directory admin center. Click through to see all the AD forests that have been enabled for Seamless SSO. If your tenant has an Azure AD Premium license associated with it, you can also look at the sign-in activity report in the Azure Active Directory admin center. 81001 User's Kerberos ticket is too large. Reduce the user's group memberships and try again. 81002 Unable to validate the user's Kerberos ticket. See the troubleshooting checklist. 81003 Unable to validate the user's Kerberos ticket. See the troubleshooting checklist. 81004 Kerberos authentication attempt failed. See the troubleshooting checklist. 81008 Unable to validate the user's Kerberos ticket. See the troubleshooting checklist. 81009 Unable to validate the user's Kerberos ticket. See the troubleshooting checklist. 81010 Seamless SSO failed because the user's Kerberos ticket has expired or is invalid. The user needs to sign in from a domain-joined device inside your corporate network. 81011 Unable to find the user object based on the information in the user's Kerberos ticket. Use Azure AD Connect to synchronize the user's information into Azure AD. 81012 The user trying to sign in to Azure AD is different from the user that is signed in to the device. The user needs to sign in from a different device. 81013 Unable to find the user object based on the information in the user's Kerberos ticket. Use Azure AD Connect to synchronize the user's information into Azure AD. Ensure that the Seamless SSO feature is enabled in Azure AD Connect. If you can't enable the feature (for example, due to a blocked port), ensure that you have all the prerequisites in place. If you have enabled both Azure AD Join and Seamless SSO on your tenant, ensure that the issue is not with Azure AD Join. SSO from Azure AD Join takes precedence over Seamless SSO if the device is both registered with Azure AD and domain-joined. With SSO from Azure AD Join the user sees a sign-in tile that says "Connected to Windows". Ensure that the Azure AD URL (https://autologon.microsoftazuread-sso.com) is part of the user's Intranet zone settings. Ensure that the corporate device is joined to the Active Directory domain. The device doesn't need to be Azure AD Joined for Seamless SSO to work. Ensure that the user is logged on to the device through an Active Directory domain account. Ensure that the user's account is from an Active Directory forest where Seamless SSO has been set up. Ensure that the device is connected to the corporate network. Ensure that the device's time is synchronized with the time in both Active Directory and the domain controllers, and that they are within five minutes of each other. Ensure that the AZUREADSSOACC computer account is present and enabled in each AD forest that you want Seamless SSO enabled. If the computer account has been deleted or is missing, you can use PowerShell cmdlets to re-create them. List the existing Kerberos tickets on the device by using the klist command from a command prompt. Ensure that the tickets issued for the AZUREADSSOACC computer account are present. Users' Kerberos tickets are typically valid for 10 hours. You might have different settings in Active Directory. If you disabled and re-enabled Seamless SSO on your tenant, users will not get the single sign-on experience till their cached Kerberos tickets have expired. Purge existing Kerberos tickets from the device by using the klist purge command, and try again. Review the domain controller logs. If troubleshooting didn't help, you can manually reset the feature on your tenant. 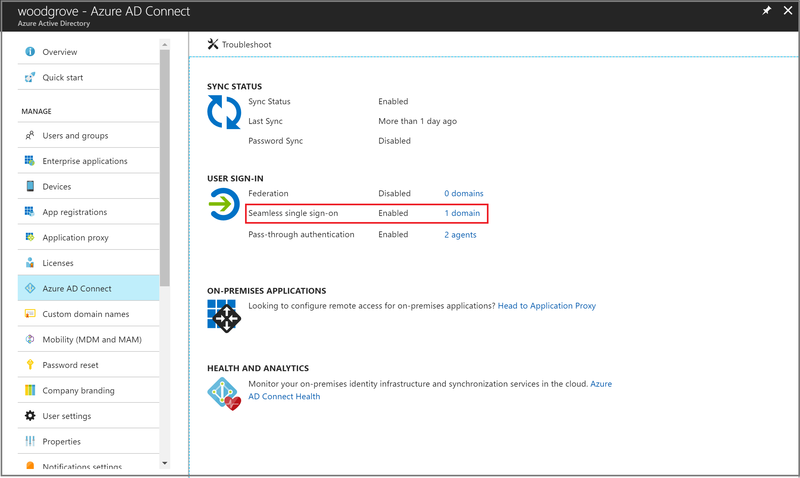 Follow these steps on the on-premises server where you're running Azure AD Connect. Browse to the %programfiles%\Microsoft Azure Active Directory Connect folder. Import the Seamless SSO PowerShell module by using this command: Import-Module .\AzureADSSO.psd1. Run PowerShell as an administrator. In PowerShell, call New-AzureADSSOAuthenticationContext. When prompted, enter your tenant's global administrator credentials. Call Get-AzureADSSOStatus. This command provides you with the list of Active Directory forests (look at the "Domains" list) on which this feature has been enabled. Call $creds = Get-Credential. When prompted, enter the domain administrator credentials for the intended Active Directory forest. Call Disable-AzureADSSOForest -OnPremCredentials $creds. This command removes the AZUREADSSOACC computer account from the on-premises domain controller for this specific Active Directory forest. Repeat the preceding steps for each Active Directory forest where you’ve set up the feature. Call Enable-AzureADSSOForest. When prompted, enter the domain administrator credentials for the intended Active Directory forest. Repeat the preceding step for each Active Directory forest where you want to set up the feature. To turn on the feature on your tenant, call Enable-AzureADSSO -Enable $true.